Synopsis, Our Opinion: A dashing Italian red that has plenty of value. Producer/Winery: Società Agricola Ciù Ciù; Offida, Italy. 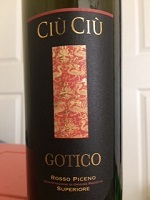 Grape Variety: Blend – 70% Montepulciano and 30% Sangiovese. 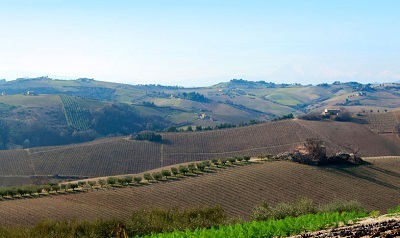 Geographic Appellation: Rosso Piceno; Marche, Italy. He said: Opened one hour before drinking. Opaque, inky purple with a slightly lighter rim. Noteworthy dark fruit and damp earth aromas. Very smooth, almost sweet on entry, gobs of fruit flavors, zesty acidity, tight fine-grained tannins and lots of tar and tobacco in the long spicy finish. It’s not complex, BUT, it’s an intense Italian Montepulciano that really holds its own when paired with a strong flavored dinner. It was GREAT with the BBQ pork pizza. 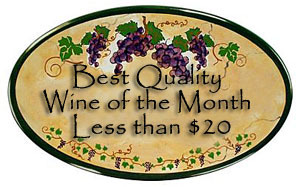 A dashing Italian red that has plenty of value. This is another Matt Bayless, (wine consultant at the Woodland Hills Wine Company) “Biggest Bang for the Buck selections” from all the wines in the store. She said: Opaque, dark garnet red with lots of evenly distributed rapidly moving thin legs. I usually opt for a beer with either pizza or barbecue, but this wine was definitely a better choice for our pizza dinner. Barbecue has strong aroma and flavor and the wine stood up to both with complementary aromas and flavors of its own. Full of juicy dark berries on the nose and palate. It was full-bodied and had a long finish with lots of tar flavor and moderate tannins. 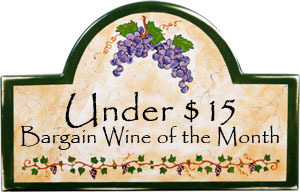 A very robust, powerful wine with a huge aroma and taste for only $16.95, but make sure you have an equally powerful dinner or the wine will overpower it. Comments: Learn more about the Società Agricola Ciù Ciù and their wines. Imported by: Villa Italia; San Francisco, California. Photo from Società Agricola Ciù Ciù.